Mr. Plow. Marge vs The Monorail. I Love Lisa. New Kid On The Block. The Simpsons Season 4 is a treasure trove of classic episodes, and we’re pretty stoked to be covering it with this month! 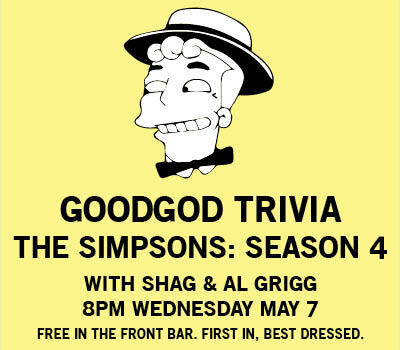 Study up, grab a crew, and choo-choo-choose The Simpsons Trivia on May 7. As always, it’s hosted by the unstoppable Al & Shag. Entry is first-in, best dressed, so come early for prime positions. Prizes and glory await.